During WUWM's Project Milwaukee series on innovation, we discovered that the research that led to the development of side airbags in vehicles took place right here in Milwaukee. Now, researchers in the same lab are trying to figure out how to protect your lower spine in a car accident. 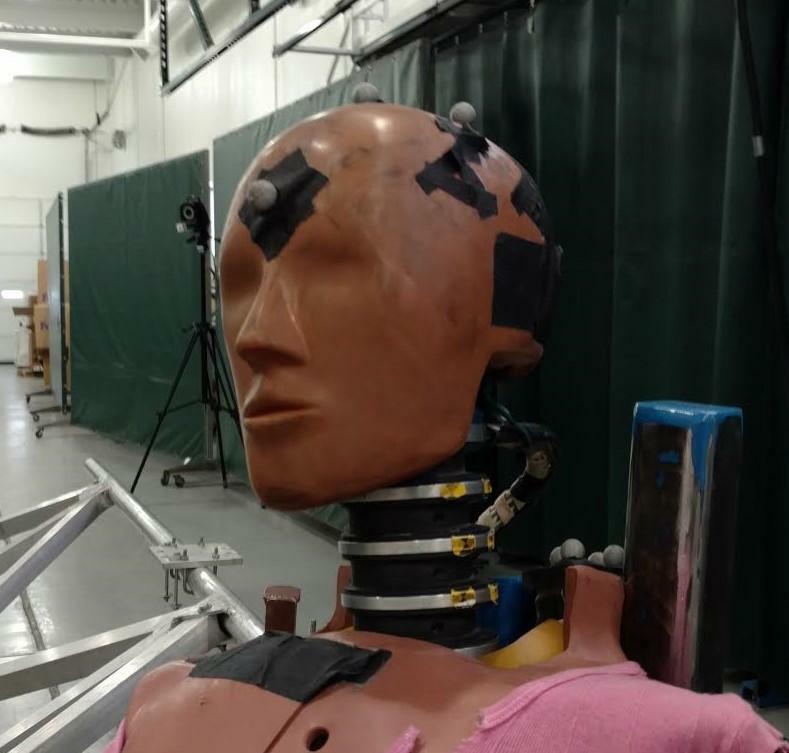 Crash test dummy head embedded with sensors to measure head impact during a car accident. When a car crashes, the newer the car, the less likely it is those inside will suffer devastating head and chest injuries. That’s because car safety experts have been focusing on those kinds of injuries for decades, according to Dr. Frank Pintar. He’s a professor of neurosurgery at the Medical College of Wisconsin, and directs its crash test lab. He says, "That’s what people die from, right? So the first thing that we want to do is to build a car that protects your chest and your head, and that’s what we’ve concentrated on over the years." And that’s what the research has led to. It's led to better seatbelts and airbags, and the addition of side impact airbags. In fact, federal vehicle side impact protection standards were revised in 2004 based on research out of MCW that found high death rates in serious head injuries in side crashes. The research led to side impact airbags becoming a standard feature in newer cars. This has saved countless lives. Dr. Pintar says, however, there’s been a trade-off. While there are fewer deadly head and chest injuries, there are more disabling lumbar spine injuries. He says researchers at the MCW Vehicle Crashworthiness Laboratory, as well as in the field and at Milwaukee hospitals are working with the Department of Transportation to figure out why there has been an increase in lower spine fracture in newer seats, in newer cars. 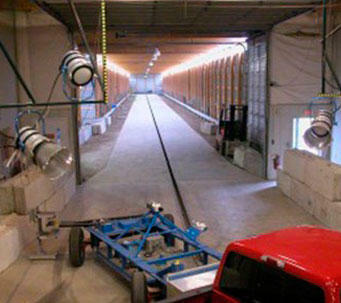 The crash test track at the MCW Vehicle Crashworthiness Laboratory is 450 feet long. Milwaukee is the perfect place to study these types of problems because MCW has the only full-scale crash test lab in an academic setting - in the world - certified by the National Highway Transportation Safety Administration, and the college has the resources to start its research soon after an accident has occurred. Engineers and doctors from MCW, Froedtert Hospital, and Children’s Hospital of Wisconsin, as part of the CIREN Program, team up to tease out what, exactly, went wrong. He says he can ask clinicians how patients were treated upon arrival ay the hospital, and he can ask crash reconstructionists exactly how the wreck occured. Dr. Pintar says it is all done together, in a group. "We discuss things though," he laughs, "some say we argue them through. That's part of it. We're all passionate about what we do, and we really like discussing things through, and getting answers." And Pintar thinks they might have found an answer as to why people in new cars are hurting their lower spines in newer cars more often. He says, "What we have hypothesized is that the seats in the new cars are being designed a little different with additional optimizing to protect the head and the chest so they will get better scores in the safety tests, but there is no trade-off criteria for the spine, and so now we’re seeing in the field fractures that we never got before." 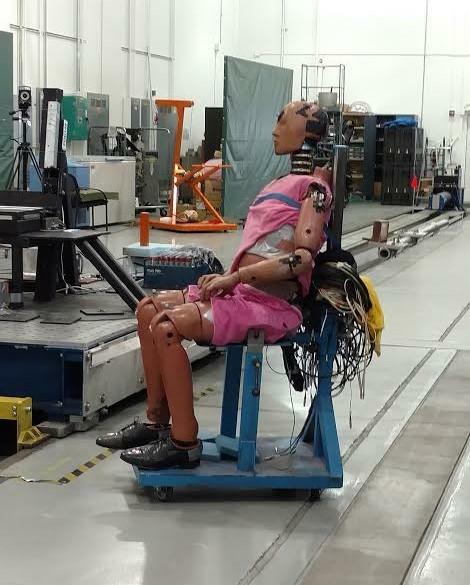 Crash test dummy embedded with sensors to measure impact in a car accident. So, the newer seat designs that protect your head and chest may put your lower spine at greater risk of fracture. Dr. Pinter says it’s now up to his team to figure out how to measure that risk. He says they're trying to develop a criteria they can give back to the federal government that they can pass along to manufacturers so they can make seats safer for your spine. Pintar says they don't have to decrease the level of protection newer seats provide to your head and chest, they just have to figure out how to protect the lumbar spine, as well. Pintar thinks they're close. His goal is to have some guidance for car manufacturers on increasing lumbar spine protection by fall. Researchers in Milwaukee have been innovating the way medicine is practiced for decades. After years of being on the leading edge of biomedical discovery, how are those in Milwaukee’s medical field competing now? News of the so-called "super lice" invasion has sent many parents into panic mode. It seems like schools around Wisconsin are “lousy” with the little guys, and are seemingly immune to traditional forms of lice removal. But local pediatrician Dr. Michael O’Reilly believes the term super lice is a bit hyperbolic.